We’ve started trying to make something resembling sake. We found a sake recipe online, but it seemed really hard so I just mixed random stuff together instead. I’m sure it’ll turn out great. We made gochujang a while ago. I added more salt to the top to discourage mold, although there hasn’t been any. The top layer of gochujang is a little drier, and is starting to get that maroon color. It’s been about a month since we made the gochujang, but it hasn’t seemed to ferment yet. No bubbles, no change in smell. It seems very well preserved. I guess I’ll just leave it out until we need it. It can mature for a few more months. You’re supposed to put gochujang in the sun every day to discourage mold. Unfortunately we don’t have a balcony and nothing is allowed in the public walkway. So for a while (until I decided it wasn’t doing anything), I put it just in front of the door with the door cracked open. That way it is technically inside, but still in the sunlight for a few hours. Our landlord contacted us the other night. Apparently another tenant has been complaining about a “horrible”-smelling (it doesn’t smell like anything) red paste outside our door. The tenant is also apparently thinks this means that we have bed bugs………..
Edit: J was all het up over it. He took it to mean that the neighbors think we’re dirty, and went on a cleaning binge. And now the shower’s super clean! But the trip was totally worth it! We did lots of other exciting things. The first planned activity was the Cupertino Historical Society. It’s a very small museum inside the Cupertino community center. Turns out that it’s free (although J left a donation), which is always nice. Afterwards we wandered around the park behind the community center. We ate our box lunches while gazing out over the pond. I believe I had leftover pasta and split peas. 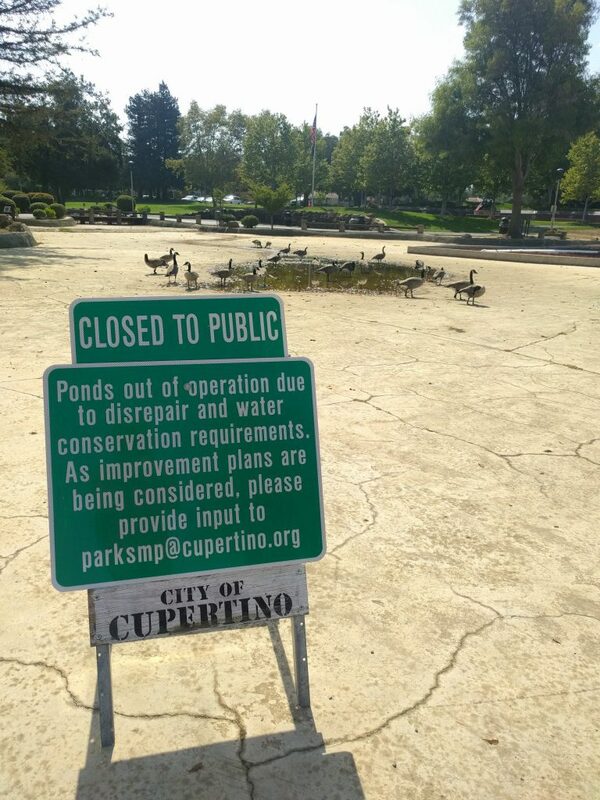 The pond is the center of bird life in the area (although there was another sign warning of specially trained geese-chasing dogs at work). Fortuitously, Cupertino was having it’s community-wide garage sale last Saturday! I love garage sales!! Wow, look at all those participants, each represented by a dot on the map. 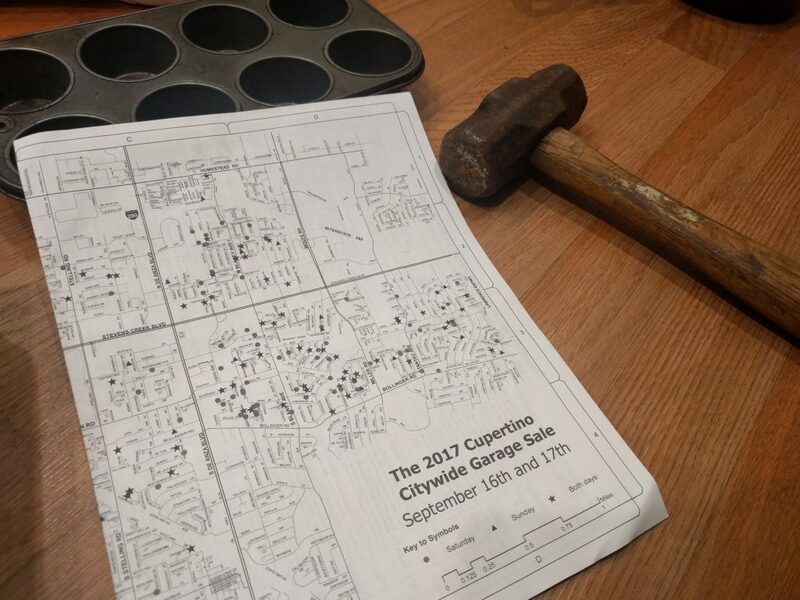 These handy maps were available in front of the community center. J and I went to several together, and I went to several more alone (while J attempted to attend the language meetup). 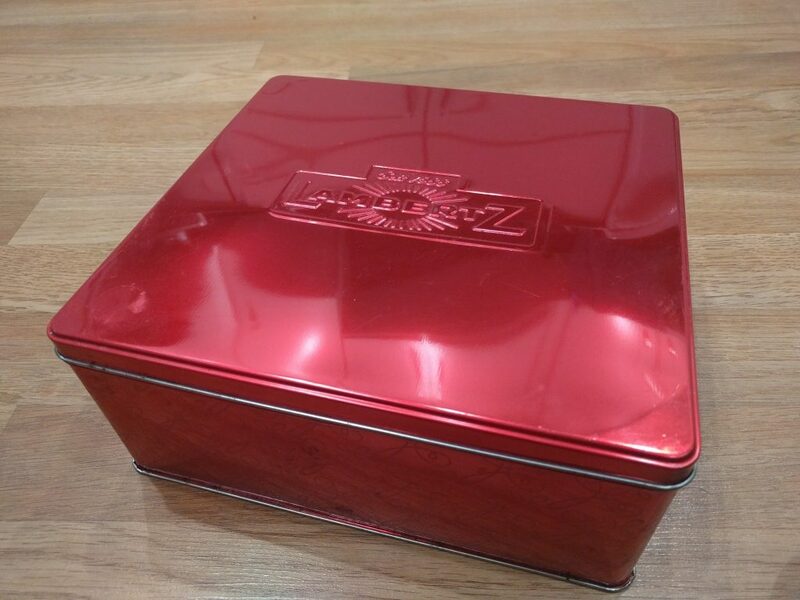 Old cookie tins for storing bread. 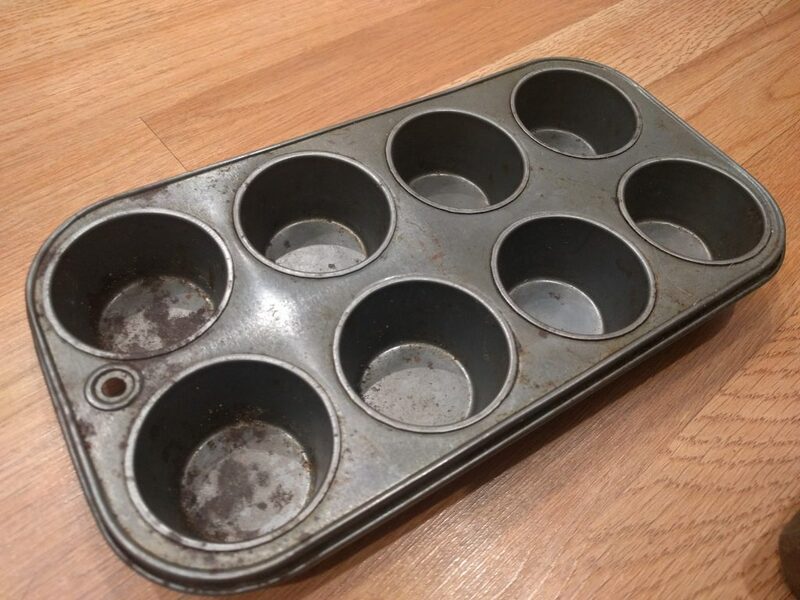 Muffin tin. It’s oddly not full-sized but not mini. Somewhere in the middle. 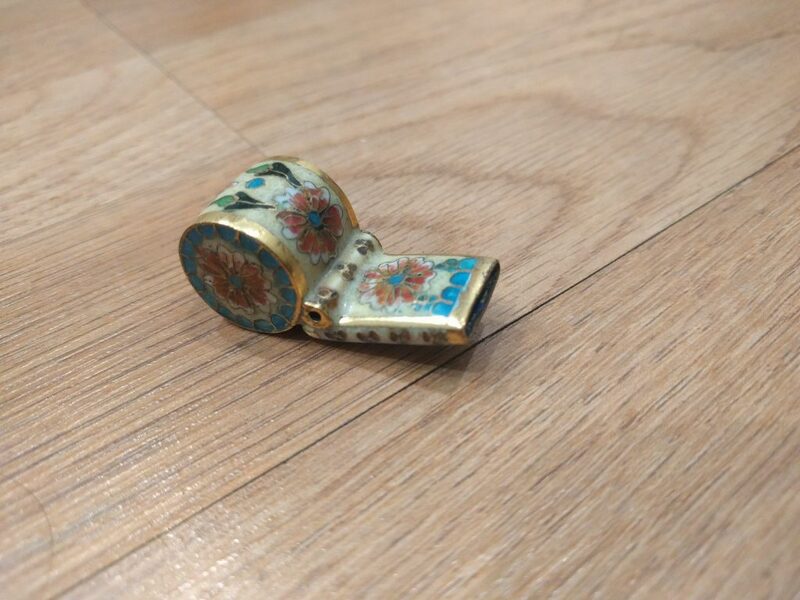 Cloissoné brass whistle. I’m not quite sure what I was thinking, but it only cost 10¢. 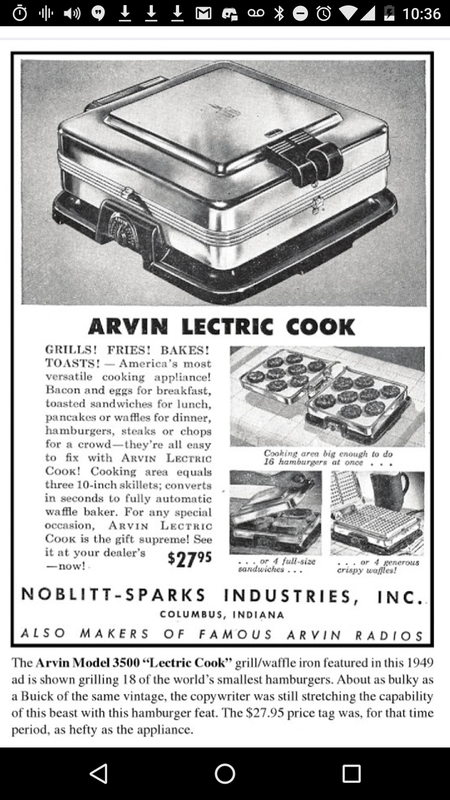 and the aforementioned waffle iron. All these were from a single jackpot sale! 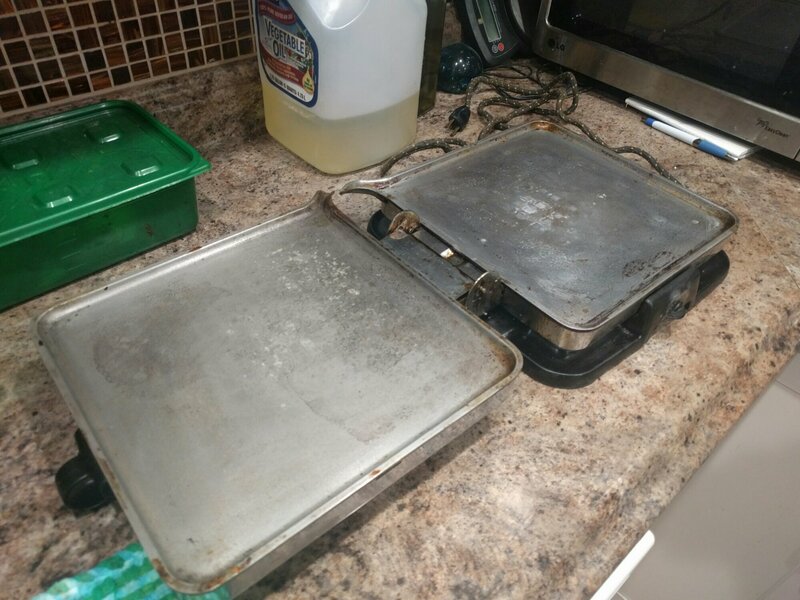 A middle-aged man and his parents were cleaning out the parents’ home, so most of the items were mid-century (hence the waffle iron). There was also lots of old tupperware, many other cookie and fruitcake tins (reminds me of my family! ), old electronics, etc. 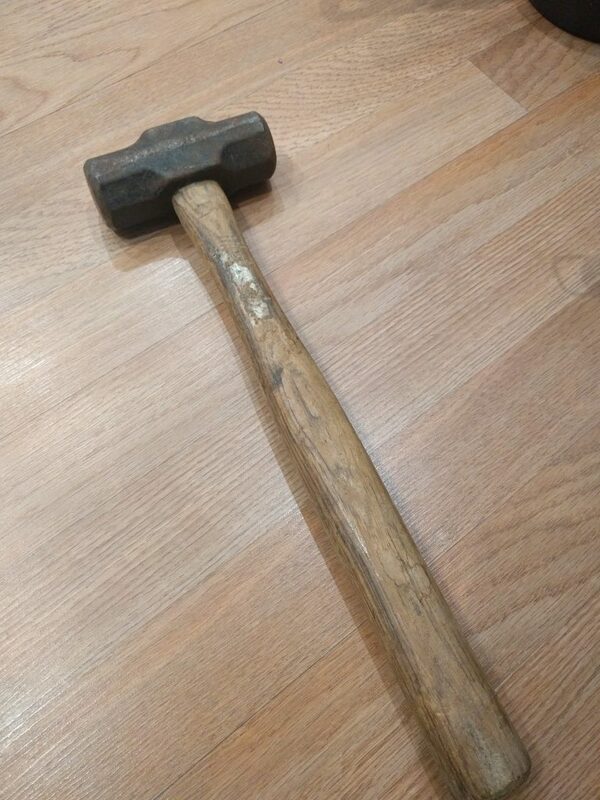 A hammer for cracking open black walnuts. I could have gotten a smaller one, but it had a plastic handle. And the man running that particular sale said that the tools were his fathers, from WW II at youngest, so I felt obligated. While I was going to garage sales, J got dinner and boba. We went to Sprouts and Whole Foods afterwards. Sprouts has some weird bulk items, like chocolate-covered honeycomb. Surely people don’t eat the honeycomb. Isn’t it made of beeswax?? 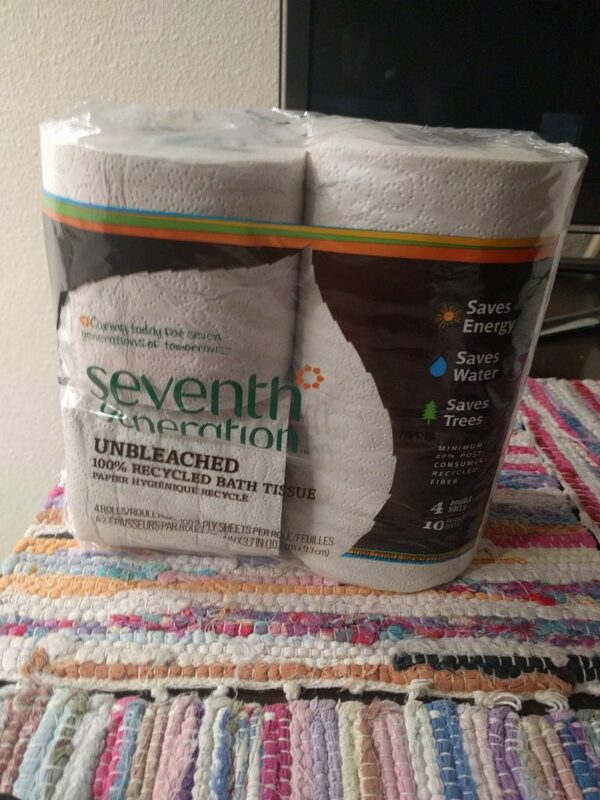 Hippie toilet paper from Whole Foods. It’s more expensive than the bleached version, for some reason. It has higher post-consumer recycled content too! After-afterwards we got bread at Paris Baguette, a Korean bakery chain. Korean-style cream cheese danish and mushroom-cheese focaccia. J and I were running low on kimchi. The last batch was from 3 or 4 months ago, so we go through about 1 quart per month. College friend S was interested, so we all got together to make kimchi! 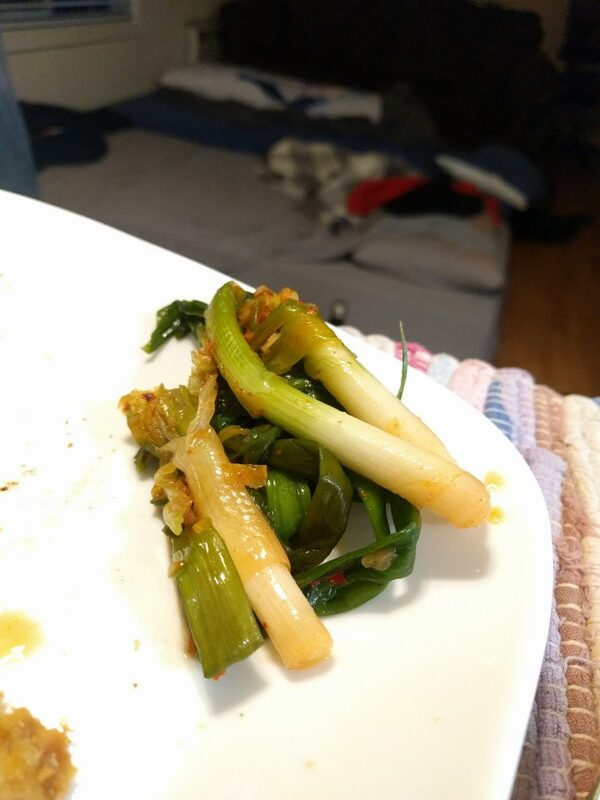 We used Maangchi’s recipe, omitting the minari (dropwort) and the Asian chives, and substituting bonito flakes for the brined shrimp. This time, we also decreased the red pepper flakes to 1 cup. We didn’t have enough Korean red pepper flakes, so I substituted cayenne pepper powder for the remainder needed. So much cabbage! It weighed about 7 lbs. 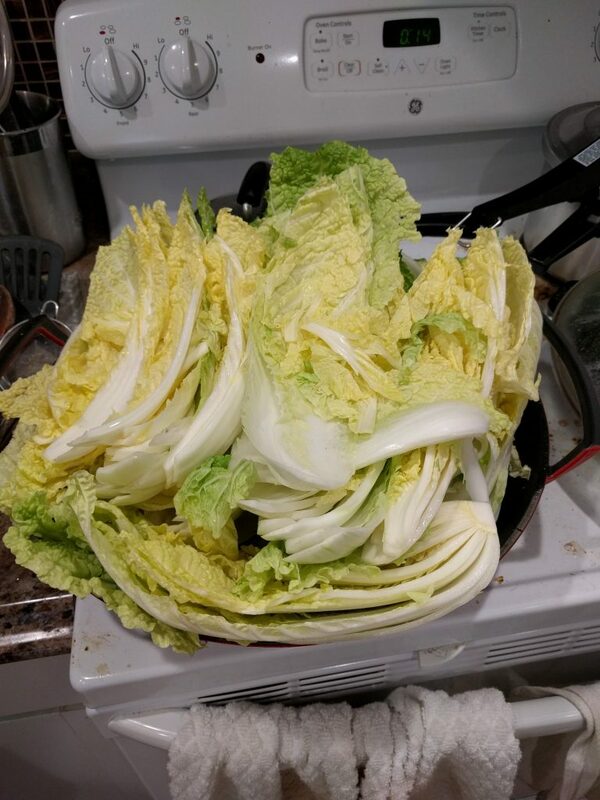 We got about 1.5 gallons kimchi, some of which will be going to friend S for her help! I added extra water to the jars to make sure the cabbage was submerged…bad idea. The CO2 produced by fermentation caused all but two of the jars to spill by the next morning. 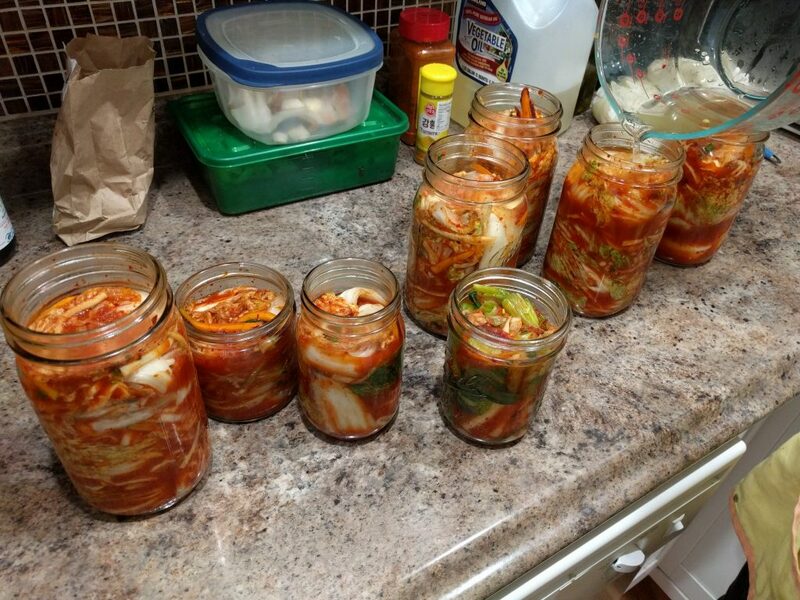 Here’s the finished pa kimchi! Out of curiosity, I looked up what bacteria are present in kimchi. The picture [the experiment] paint[s] is that the microbial population changes fairly radically over time. At first, the cabbage, which was soaked in brine, drained, and mixed with a variety of seasonings, was populated mostly by unidentified bacteria and ones from the Deferribacterales group, whose representatives have cropped up in oilfields and in the guts of deep-sea shrimp. These bacteria may have been on the cabbage to begin with, rather than having anything to do with the fermentation, because as the days passed, and the oxygen ran out, others began to take over. By the seventh day, DNA from the Leuconostoc group, which converts sugars into lactic acid and are behind the fermentation of kefir, a fermented milk drink, and sourdough bread, was on the rise. By day 13, members of the Lactobacillus and Weisellagroups had joined in. Like Leuconostoc, Lactobacillus andWeisella produce lactic acid from sugar, and they’re also part of the team behind cheese, kefir, pickles, and other fermented products. Together the three groups dominated the kimchi for the rest of the experiment. Neither J nor I really drinks alcohol. We use it, in the form of mirin and sake, for cooking. So I’ve been thinking of trying to make sake. A similar process is used to make rice vinegar. Generally speaking, sake is made by fermenting rice. Amylase is used to break down the starches in cooked rice into simple sugars. Yeast ferments the sugars into alcohol. Then there are a few filtration steps, to remove the half-digested rice chunks and clarify the liquid. More specifically, the amylase is provided by koji (Aspergillus oryzae, used as well for soy sauce, miso, makgeolli, shouchuu, etc) in modern sake production. The yeast is a specific cultivated variety or varieties. The sake is clarified using activated charcoal. This is the best article I’ve found describing in detail how to make sake. Here’s another that might be easier to follow. However I’m not interested in “proper” technique. I especially don’t want a fussy recipe where I have to buy things. 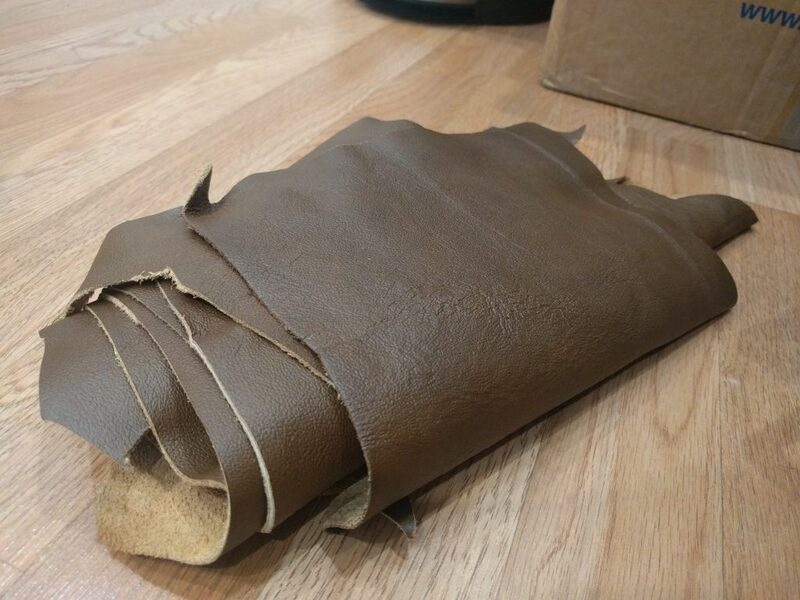 I’d rather use materials I have on hand or that are available for free (like wild yeast). So, there are less exacting traditional techniques that can be used. The amylase can be provided by saliva, as in the production of kuchikamizake (as seen in Kimi no Na wa). And the yeast can be wild, as in sourdough. 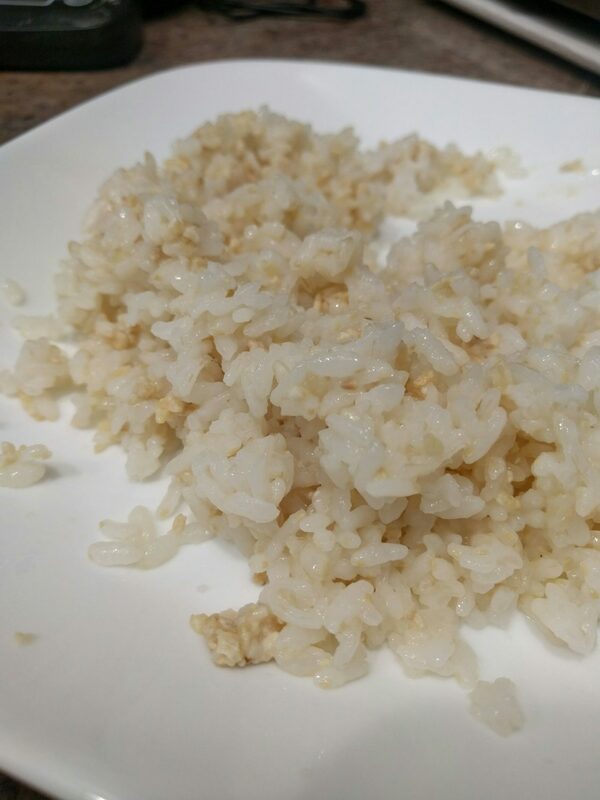 I also suspect that you can use barley malt (leftover from making gochujang) for the amylase. After all, it’s used in other alcoholic beverages. So, I’ll probably do some low-volume experiments with kuchikamizake, barley malt, and koji, of which I have a very small amount. We’ll see how it goes! 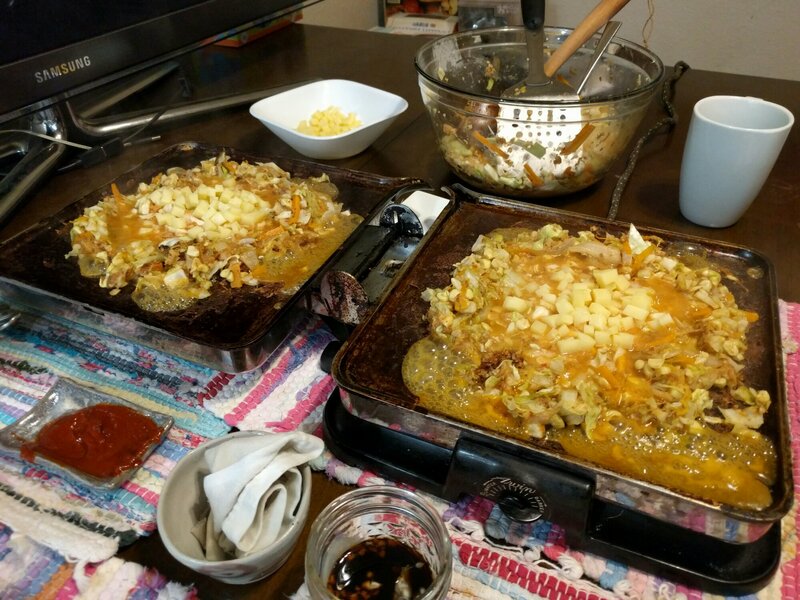 When friend S was over for kimchi making, we started talking about other foods we could make. It seems like there’s the most collective interest in vinegar and in alcohol. ( I’d like to make hard cheeses in the future as well.) So I embarked on some initial vinegar experiments! According to this source, all you need to do is inoculate an alcoholic liquid with acetic acid-producing bacteria. 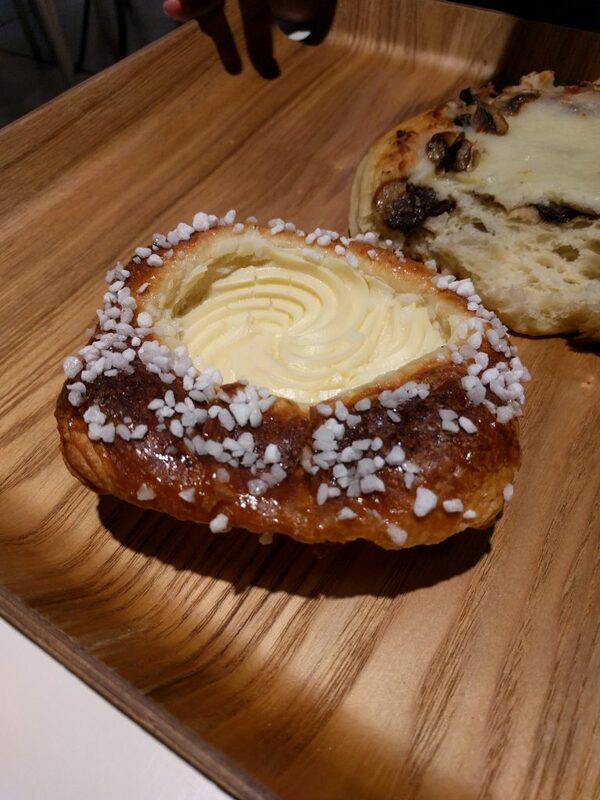 Some other sites suggested adding sugar, to provide easier-to-access food. You can get the bacteria from unpasteurized vinegar (e.g. Braggs brand), but I figured I would try inoculating with kimchi juice, since it’s sour. I’m not sure what acid is in kimchi. Some of it is lactic acid, but there might be acetic acid as well. So I mixed together some kimchi juice (1 part), a pinch of sugar, and sake (5 parts) in a little glass jar. I guess I’ll just let it sit and see what happens. I wonder if the sake is too alcoholic. It’s surely possible to kill off all the bacteria. I also discovered a vinegar subreddit (I’m not even surprised at this point). If you just looked at this, you’d think that everybody’s making their own vinegar! You may have heard that Equifax accidentally leaked everyone’s names, addresses, and social security numbers. Darn. Step 1. Sign up for a my Social Security account at: https://www.ssa.gov/myaccount/. Signing up prevents hackers signing up for you, and getting access to more of your personal information. 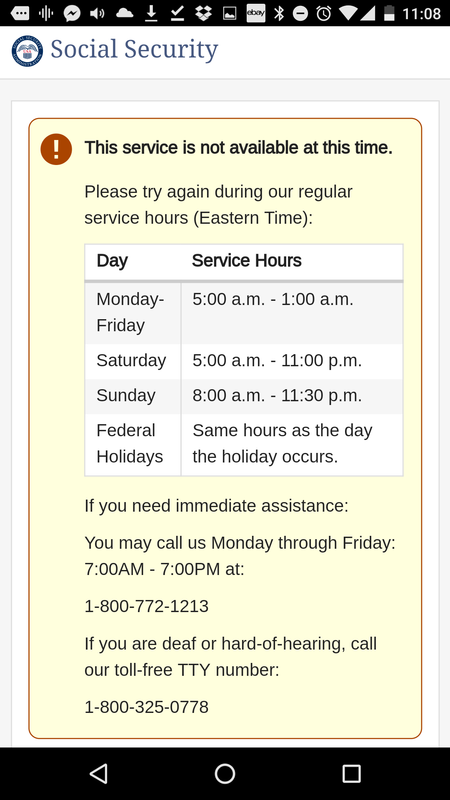 Unfortunately, signing up only works about 30% of the time, and you can only do it during the website’s business hours. If you fail more than twice, you get locked out forever. Sorry. You can try calling for help, but they’ll hang up immediately for your safety. Steps 3-5. These can only be addressed during the blog’s business hours, 2pm – 2:15pm on every Tuesday with a full moon. 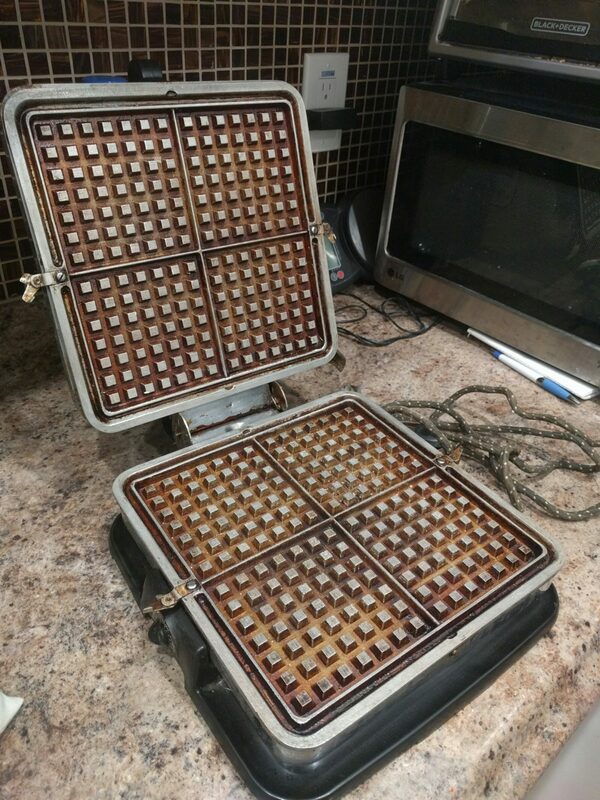 We got an early 1950s waffle maker from a garage sale! And it looks like this when you close the lid. It has a light that turns red when it’s on (it’s actually just the glow from the heating element). 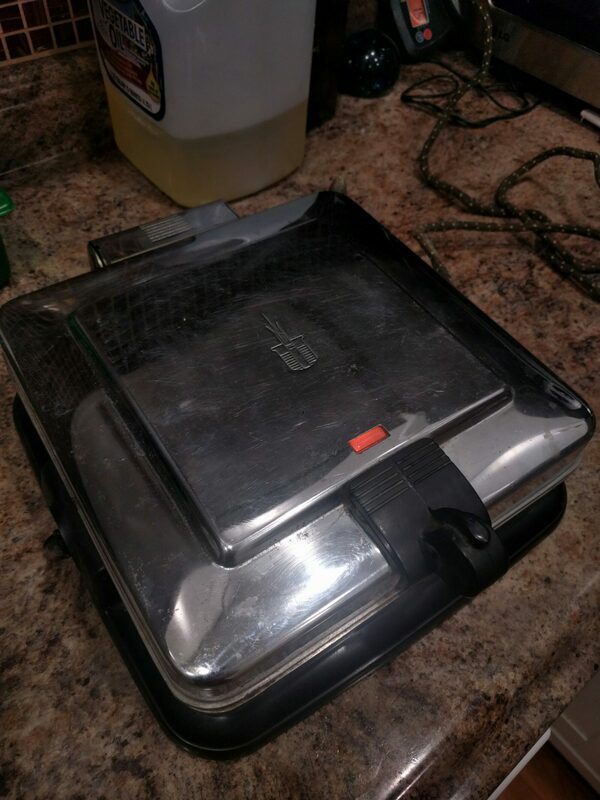 It transforms into a grill if you fold it down and take off the waffle grates. 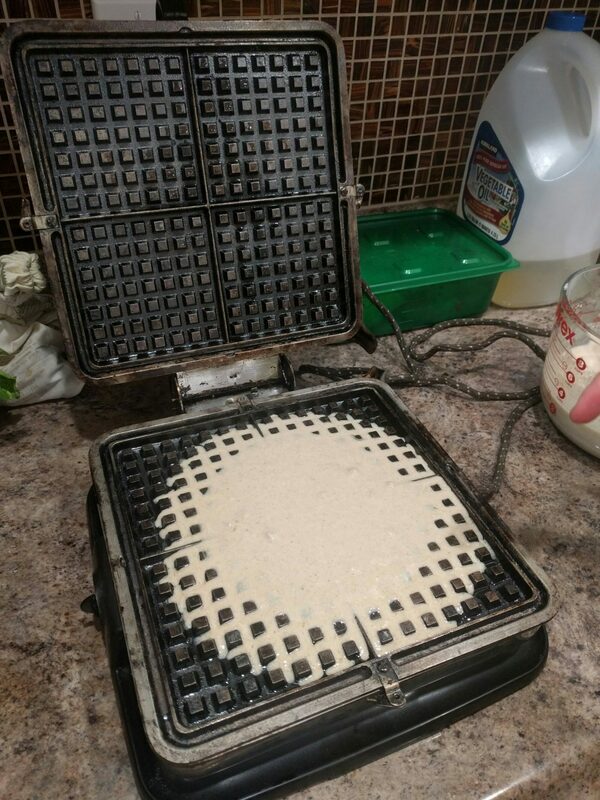 After seasoning the cast iron, we made waffles! 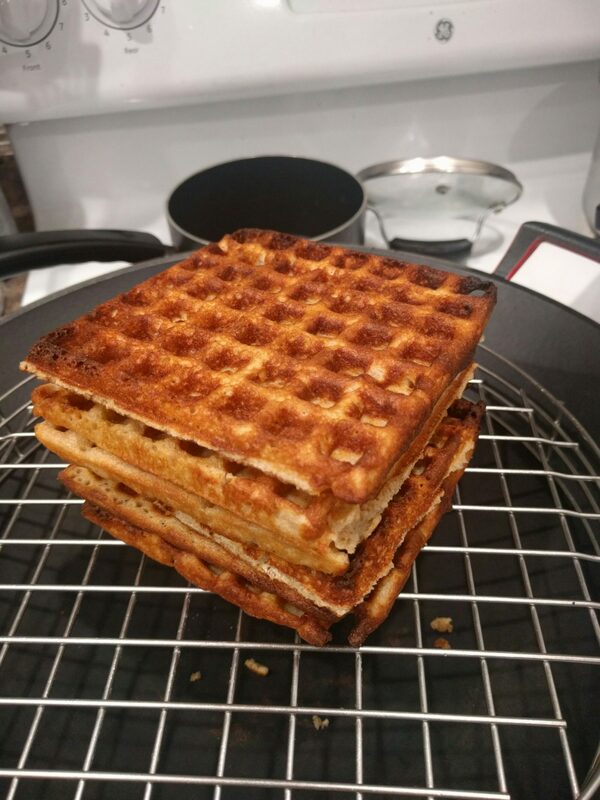 The finished waffles, only slightly burnt. 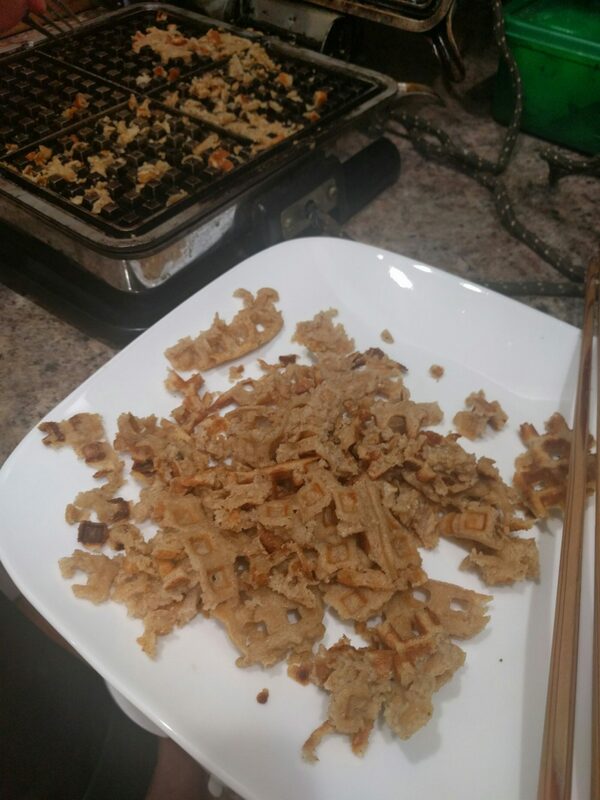 For dinner we made monjayaki using the griddle mode. It’s was great! I recently finished Dude Making a Difference by Rob Greenfield, of RobGreenfield.tv. The book is a diary-style account of the author’s adventure across the US by bike. He did it as a pro-environmental publicity stunt, to show how little one can really live on. The point was to put into perspective how excessive the average American lifestyle is.